Executive Lawyer of the Spanish desk, Raquel Neira Feàns focuses on general personal injury law, forex litigation, and family law. 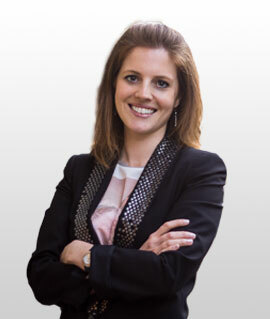 She advises and represents clients on a wide range of contentious and non-contentious public international law and international dispute resolution issues. Recent highlights of her practice include advising clients for filing the claim in a high-profile dispute against Evolution Marketing Group, Finanzas Forex. Showing great empathy with clients, Raquel has a sympathetic approach, allied with a determination to see the most difficult and protracted cases brought to a successful resolution. She also specialises in all aspects of private family law, with particular emphasis on the financial consequences of relationship breakdown including cases where there are substantial assets, trusts, pensions and family businesses. She also deals with disputes regarding children. She has experience in dealing with high value and complex personal injury cases, predominantly in high value and serious or fatal injury cases arising from road traffic, industrial and other accidents. After attending high school in the “Compañía de María” of Vigo, Raquel Neira graduated in Law in 2010 from the Universidad de Vigo, with business economics. In 2008-09 she attended the University of Perugia. She gained a degree in “Italian Language and Culture” in 2009-2010, issued by the University for Foreigners of Perugia. In February 2013, she was admitted to the Law School of Vigo in Spain. She speaks Spanish , Gallego (Native), Italian, English, and Portuguese.